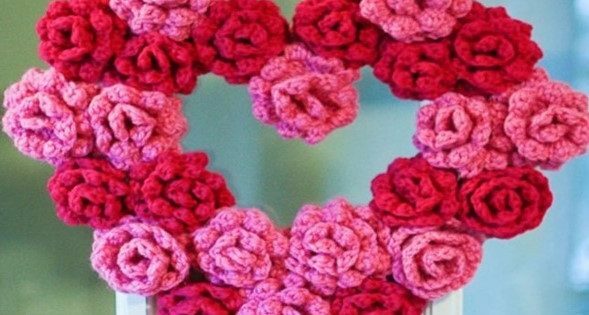 This front door crocheted rose heart wreath adds personality to any front door and comes out in a vibrant combination of colors. Why not have some fun decorating your front door for a special occasion? The designer of this lovely front door wreath is Kara over at Petals to Picots. Use hot glue to attach them. The finished size of this stunning crocheted rose heart wreath depends on how big you want your wreath to be. You can access the crochet pattern of this amazing rose heart wreath for FREE from the Petals to Picots website . To access the FREE crochet pattern for the little roses of this stylish front door wreath, please click here: Rose Pattern.